New research from Yale University shows that the hormone FGF21, which extends lifespan in mice by 40%, protects against the loss of immune function that comes with age. Published online in the Proceedings of the National Academy of Sciences on January 11, the study’s findings have future implications for improving immune function in the elderly, for obesity, and for illnesses such as cancer and type-2 diabetes. 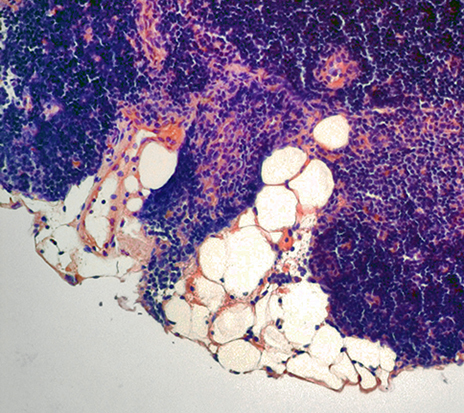 When functioning normally, the thymus produces new T cells for the immune system, but with age, the thymus becomes fatty and loses its ability to produce new T cells. This loss of new T cells in the body is one cause of increased risk of infections and certain cancers in the elderly. Led by Vishwa Deep Dixit, professor of comparative medicine and immunobiology at Yale School of Medicine, the researchers studied transgenic mice with elevated levels of FGF21. The team knocked out the gene’s function and studied the impact of decreasing levels of FGF21 on the immune system. They found that increasing the levels of FGF21 in old mice protected the thymus from age-related fatty degeneration and increased the ability of the thymus to produce new T cells, while FGF21 deficiency accelerated the degeneration of the thymus in old mice. “We found that FGF21 levels in thymic epithelial cells is several fold higher than in the liver — therefore FGF21 acts within the thymus to promote T cell production,” said Dixit. “Elevating the levels of FGF21 in the elderly or in cancer patients who undergo bone marrow transplantation may be an additional strategy to increase T cell production, and thus bolster immune function,” said Dixit. Dixit added that FGF21 is produced in the liver as an endocrine hormone. Its levels increase when calories are restricted to allow fats to be burned when glucose levels are low. FGF21 is a metabolic hormone that improves insulin sensitivity and also induces weight loss; therefore it is being studied for its therapeutic effects in type-2 diabetes and obesity. Dixit said further studies will focus on understanding how FGF21 protects the thymus from aging, and whether elevating FGF21 pharmacologically can extend the human healthspan and lower the incidence of disease caused by age-related loss of immune function. Other authors on the study include Yun-Hee Youm, Tamas Horvath, David Mangelsdorf, and Steven Kliewer. The study was funded by The National Institutes of Health, The Robert Welch Foundation, and the Howard Hughes Medical Institute. 1 Comment on "Life-Extending Hormone FGF21 Also Protects Against the Loss of Immune Function"
Inducing FGF21 levels in thymic epithelial cells which are several fold higher than in the liver, to produce more T cells which are immune cells to act against the disease is a good idea and the article is appreciated. The loss of immune cells is evident in the elderly people who are more prone to pneumonea and lung infections because they don’t have sufficient immunity to protect themselves. Auto immune diseases are also the reason for rheumatic knee pain particularly in elders which requires knee replacement. A number of autoimmune diseases can be enumerated for the elderly people. This treatment is good enough for them to live a functional and useful life in the greying population, though not intended for extending longevity. Longevity with disease is worse than without disease crippling one’s quality of life. Thank You.